This was taken just down the road from Monday’s photo. It provided some additional challenges. I had to shoot across the road to get this and it was difficult to find a vantage point that got me the tree in the spot within the frame, avoided traffic and kept power lines from spoiling the scene. In the end I had to settle for just a minor intrusion from a power line but I removed it during processing. If you live within a few hours drive from Yosemite, you really should take advantage of this opportunity and see it for yourself. This shot was also taken with my Canon 5D and 100-400L with the lens at 130mm. The exposure was 1/30th of a second at f/11 and ISO 100. 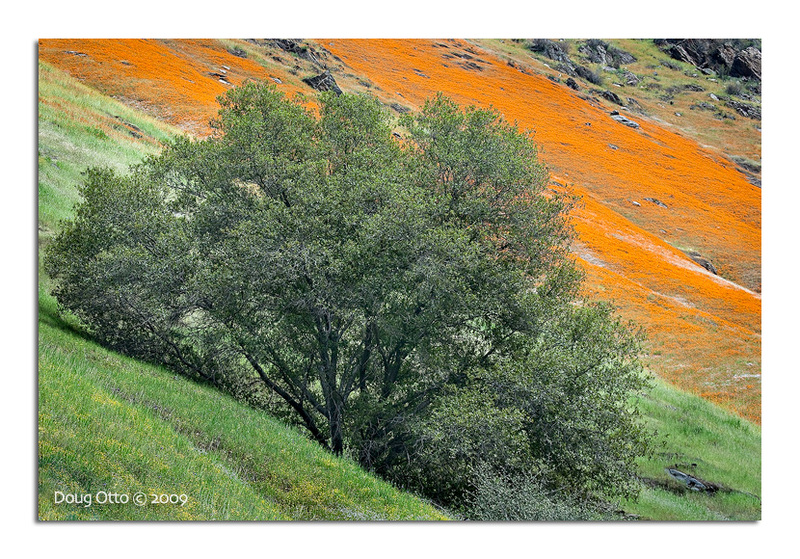 This entry was posted in Photography, Travel and tagged Canon 100-400, Canon 5D, doug otto, Merced River Canyon, Poppies, Telegraph fire, yosemite. Bookmark the permalink.